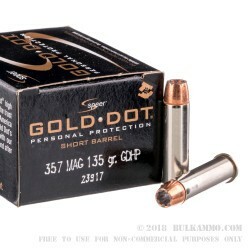 Speer Gold Dot ammunition was the first handgun ammo loaded with true bonded-core bullets. Speer engineered their exclusive Uni-Cor method that bonds the jacket to the core in the beginning of the bullet construction process. 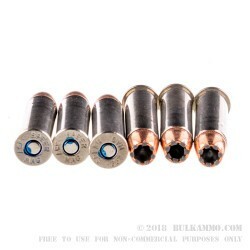 These specially designed short barrel rounds are made specifically for compact handguns with barrels as short as 1.9 inches while having reduced felt recoil and still providing excellent expansion and penetration! Tested with a 2-inch vented barrel, the muzzle velocity of these rounds is 990 fps with a muzzle energy of 294 ft/lbs. That’s more than enough energy to ward off would be attackers and you don’t have to carry a hand cannon in order to do it! Each of Speer’s Gold Dot hollow point calibers are tuned by specific weight to ensure excellent performance. 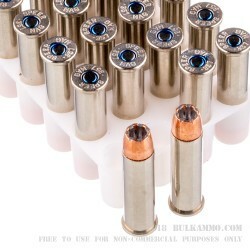 Their hollow point cavities are formed in two separate stages, how far it expands and how fast it should expand. Speer has patented this formation giving their engineers incredible control over the design process, and their Uni-Cor bonding method has virtually eliminated core-jacket separation. 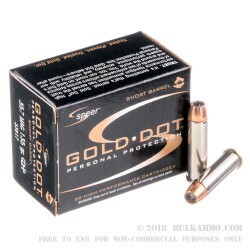 As you can see, Speer’s Gold Dot rounds are engineering marvels and shows how serious Speer is about keeping on top of the ever-changing ammunition game.